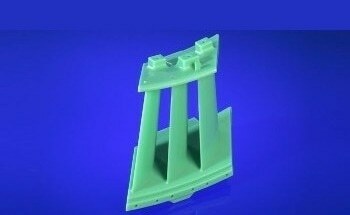 Aerospace operations demand the use of high-quality wax patterns and wax runner systems to achieve successful investment casting. However, there is a growing debate over whether these runner systems and patterns are best manufactured in-house or outsourced. Traditionally, most aerospace manufacturers prefer in- house handling of these patterns. Their view has typically been that it allows for higher precision, greater flexibility and process control. The matter of control – knowing what is being produced, when and by who is probably a given, but is this information absolutely necessary? If the required components are available at the time and the place they are needed, then the place of manufacture becomes less relevant. Precision is one of the major parameters to be taken into account. The level of precision of wax pattern manufacture depends on the equipment used to produce it. The post-production treatment, which includes complex, highly-skilled assembly work, is still produced manually. Hence a high level of precision can only be achieved based on the availability of state-of-the- art equipment and using the equipment to its optimum capability. This will ensure error-free post- production treatment. In such cases, an exclusive wax production facility may offer several benefits over a production facility providing multiple operations. Flexibility of manufacture is another concern associated with in-house facilities. The in-house resource will be working only on patterns required by the company, and hence the finite resource can only produce a certain amount of runner systems or patterns in a given shift time, which can lead to delays and issues at the time of great demand in other parts of the facility. The partial or full outsourcing is carried out by a topline cost comparison. The smaller, specialist companies can deliver cost-effective operations than the large multi-function production facilities. A further issue can arise when the wax patterns and runner systems are supplied to the company which will undertake the manufacture of ceramic cores for the investment casting process which is rarely handled in-house. The issue is one of accountability. Where does responsibility lie if one or more of the final patterns is found to be out of tolerance? Even a small error from the CAD design can result in a faulty component, meaning high costs of rework or replacement. All these factors are behind a moving trend among some of the major companies in the aerospace sector to outsource their wax processes to the companies that manufacture the ceramic cores used in investment casting. In terms of outsourcing the wax pattern, the aerospace manufacturer is free from purchasing and maintaining the capital equipment or the issues related to human resources such as recruitment, training, sick pay, etc. All these requirements now fall to the supplier. Most of the suppliers will invariably seek to invest in the state-of-the- art solutions and highly trained staff in order to remain competitive. Furthermore, being specialists in wax injection and core manufacture, these suppliers will have separate resources in situ which allows the companies to easily meet high demands of supply. Outsourcing also solves the problem of accountability in investment casting. By converting the wax patterns into a ‘bought out’ product, the cores can be matched with the patterns thereby minimizing the level of engineering work. When they operate with stringent quality standards, small quantities of scrap generated will be accepted by the supplier and the cost and will not be passed on to the customer. In addition, the agile, flexible working practices followed by the specialist suppliers make them suitable to cope with short lead times if required, with turnarounds as small as 12h. It can be concluded that the companies that wish to maintain in-house production of some of their components can still benefit from outsourcing, particularly at the time of great demand. This level of flexibility can make the outsourced solution ideal for aerospace manufacturers, which will not act as a supplier of all wax and core processes but also a strategic partner in optimizing the replicability, quality and delivery of the wax patterns.